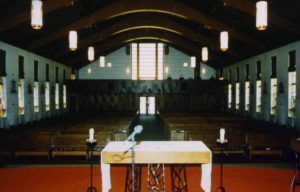 View of the Worship Space before the renovation. Our Lady of Fatima Church was a fairly typical suburban Catholic church building. Designed and built in 1955 as the first structure for a newly formed parish, it was a design that proliferated in the 1950’s and beyond. A rectangular building with exposed concrete block walls, its only redeeming feature was the wood beam roof structure. It remained substantially unchanged for forty years. 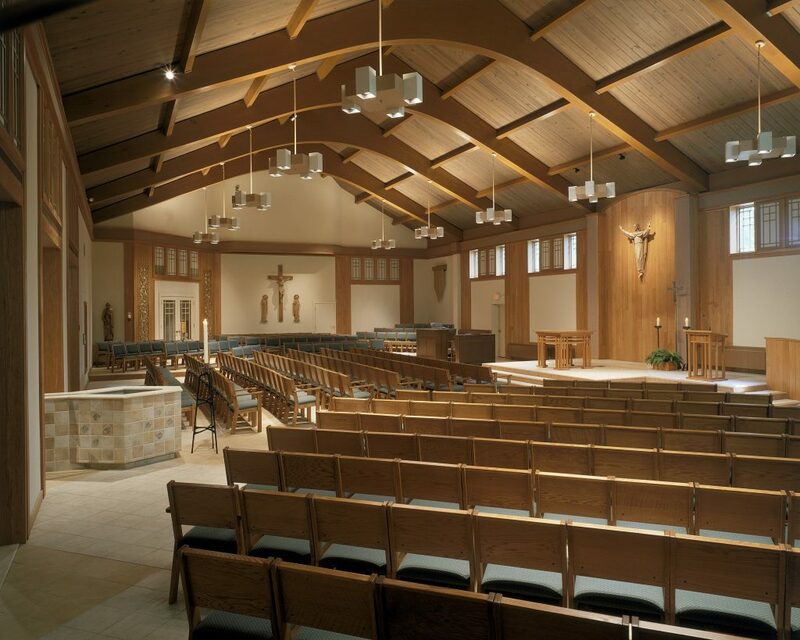 In response to the Second Vatican Council directives, renovations to the altar area were made circa 1973, consisting primarily of an extended platform area for the liturgical action and the choir, as well as new liturgical furnishings. Access for the disabled throughout the facility was included on almost every group’s list. This included wheelchair access to all areas as well as appropriate seating areas for wheelchairs within the Worship Space. Parishioners expressed a strong desire for improved lighting to increase the visibility of the liturgical action and the written word. Concerns were also expressed regarding the quality of the sound reinforcement system. 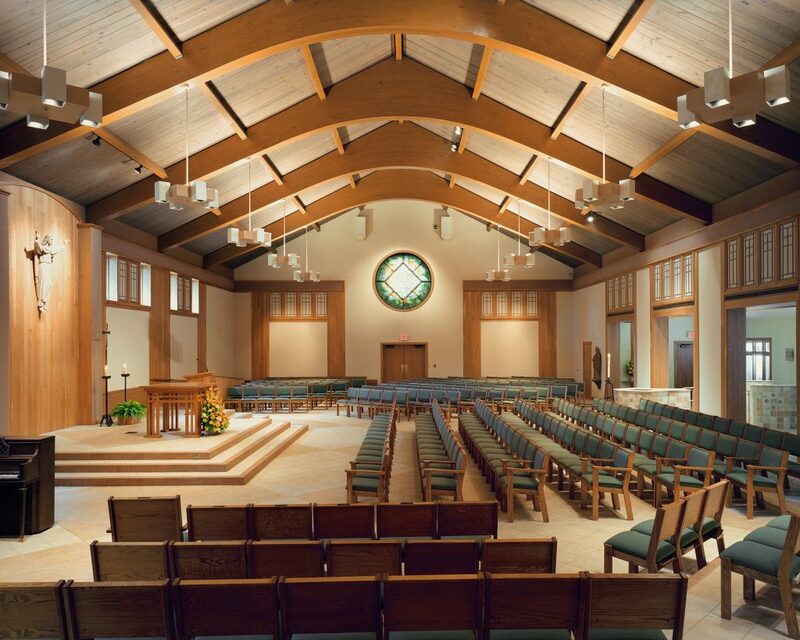 Parishioners also felt that rearrangement of the seating should be considered so that they can be involved as participants and not as spectators. Most parishioners felt that the existing worship environment lacked warmth and beauty and that aesthetic improvements were needed. An increase in the amount of natural light also seemed desirable to most parishioners. There was some concern that the existing worship environment might not be totally appropriate for post-conciliar liturgies. The arrangement of the existing space did not encourage the communal aspect of the worship experience that already seemed to be present among the parishioners. Rearrangement, redecoration and refocusing through appropriate lighting were all to be considered. The configuration of the worship space was not effective in serving the action of the assembly. Due to the crowded location of the Music Ministry, the inadequate lighting and sound systems and the placement of liturgical centers of action, the environment did not bring people close together so that they could see and hear the entire liturgical action and become involved in the liturgy. The altar was neither accessible nor central to the congregation. The parishioners wanted a new, more appropriately designed altar in a more accessible and central location. The existing baptistry was too small and remote to function effectively as a symbol of this important sacrament of initiation. A new, larger font, possibly with moving water, in a more visible location was to be considered. The parishioners also seemed open to the possibility of an adult immersion font. 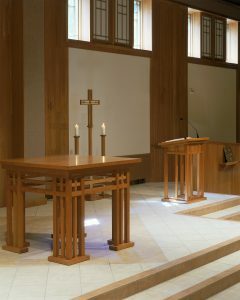 A new, private chapel for reservation of the Blessed Sacrament was required so that the tabernacle could be relocated from its current location on the altar platform. The Reconciliation Chapel was located in an inaccessible space behind the altar platform. Because it shared space with the choir storage, it was not set up in a way that was conducive to proper celebration of the Sacrament of Reconciliation. The area for the Music Ministry was much too crowded and its proximity to the liturgical action made it distracting during worship. Relocation of the Music Ministry to a larger, more distinct area, with appropriate lighting, was required. The location was to maintain a position of leadership without making the Music Ministry a focal point. The process for meeting the defined needs of the parish was a carefully planned process. Working with a committee that represented all areas of parish life, the architect developed various solutions until there was unanimous agreement on one solution. This solution was then presented to the parish at another open meeting, where parishioners were invited to comment on the work of the committee and the architect. Comments from this meeting were then incorporated into the final Master Plan. Once the Master Plan had been accepted by the committee and the diocese, fund raising for the project began. The fund raising goal of $950,000 was quickly achieved and the committee began to work with the architect on the final plans. Midway through the development of the final design, another presentation was made to the parish to provide additional information about finishes, costs, etc. Other artists were also brought into the process for the design of art glass and liturgical furnishings. Lighting design and acoustical consultants also brought their expertise to the project. The final solution for the needs identified by the parish consisted of a fourteen-foot wide addition along the entire length of the building, coupled with the removal of the balcony and the reconfiguration of the Worship Space. 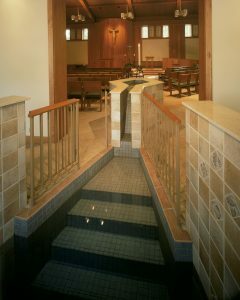 The new addition provides a large area for baptisms at the entry to the Worship Space as well as convenient access to new indoor and outdoor gathering areas. This entry/gathering area also includes an area for Marian devotion. The font in this church provides opportunities for both infant and adult immersion. Water flows from the upper basin, which is large enough to immerse an infant, down to the three-foot deep adult immersion area. Steps accessible from both sides of the font allow the candidate and the baptismal candidate to enter the baptismal waters together. The lower basin is enclosed by two sarcophagus-like walls with fossilized tiles and open railings that provide visibility into the lower basin. Accessible entries to the building are provided on both the upper and lower levels and all spaces within the building are now accessible. An assistive listening system provides accessibility for the hearing-impaired. The reoriented Worship Space allows the congregation to gather around the altar and ambo, which are on a platform that is both visible and accessible. The Music Ministry is on risers to improve visibility and acoustics. The interior was completely redone in the American Prairie style, with new cherry woodwork, porcelain tile floor, new lighting and sound system. The room was carefully tuned to provide the desired acoustical environment by the subtle integration of acoustical materials into the wall finishes. Speakers for the sound system are hidden behind columns of the same acoustical fabric on either side of the altar. The new lighting accentuates the original building’s beautiful wood beamed ceiling. Worship Space. A southwestern window that was a constant source of glare was replaced with a new, smaller stained glass rose window. Architectural details from the original church were incorporated into the door surrounds at the main entry and the Eucharistic Reservation Chapel. All liturgical furnishings were designed and crafted by the same craftsman, in collaboration with the architect and the owner. New furnishings included the altar, ambo, tabernacle, processional cross, candlesticks and credence table. 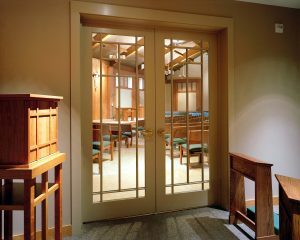 A new Eucharistic Reservation Chapel was created that provides a private room that is accessible even when the Worship Space is locked. Glass doors allow the tabernacle to be seen upon entering the Worship Space. The double doors can also be opened and the chairs in the Assembly rearranged for Eucharistic services. Space constraints required that the same room serve as both Reconciliation Chapel and Vesting Sacristy. Located near the baptismal font, the room was carefully designed so that the vestments were hidden behind two large oak panels that enhance the sacramental environment. The screen was also custom designed so that it could be transformed into a writing desk so that the pastor could use this space as a private study during the week. The renovated church and new altar were dedicated on May 13, 1998, less than three years after the first parish meeting. The speed of this renovation was due largely to the efforts of a very well organized chairwoman of the Renovation Committee, a very efficient chairman for the fundraising effort and an enthusiastic pastor who helped his parishioners understand the benefits of a renovated worship space. Over the past five years, this parish has been enjoying the flexibility provided by their new worship space. They have frequently rearranged the seating for various liturgical celebrations and have enjoyed witnessing full immersion adult baptisms, as their parish continues to thrive and grow in their new space. This article originally appeared in the May 2004 issue of Ministry & Liturgy. Design by James Hundt. All photographs are by Randall Perry Photography.